Recruitment For The Post Of Constable (Tradesmen) (Male/Female) In Border Security Force For The Year 2019. The Boarder Security Force, India, Is Recruiting Over 1700 Eligible Candidates, So Eligible & Interested Male/Female Candidates Can Apply For This Job Through Offline Application Form. Kindly Do Check Out The Official Notification For Accurate Information. Various Tradesmen Posts, Check Out The Image Below For More →1,763 Vacancies. 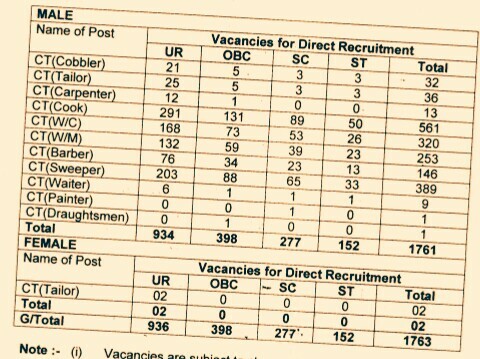 Total Number Of Vacancies →1,763 Vacancy. B. Eligible Criteria For BSF Advertisement 2019. Age Limit →18 To 23 Year, As On 1st Of August, 2019. Educational Qualifications →Matriculation & Degree In Concern Discipline. Mode Of Examination/Selection Process →Skills Test. Last Date For Offline Application Form Submission Date →Should Reach The Application Form Within 24th Of February, 2019. For More Information →Check Out The Official Website Here To Know About More Link Is Here>The Official Website Of BSF. Click Here To Download The Official Offline Application Form & Notification.